Keep essential GHS information in one place for easy recognition & accessibility. Choose from Seton’s line of affordable & top-quality GHS Right-to-Know Stations & see how easy it is to organize & manage safety data sheets for your facility. All the guidance you need is provided below. If you need further assistance, please call 1-866-971-3962 and one of our product experts will guide you to the right GHS right-to-know station you need. Our offering includes single RTK stations with 2" or 3" binders and double stations with two 3" binders. Binders are available with both English and Spanish versions for bilingual workplaces! Safety Data Sheets (SDS) provide essential information about a substance or mixture used in the workplace and are thus a vital component of the Globally Harmonized System (GHS) of Classification and Labeling of Chemicals. The GHS enumerates the criteria for the classification of environmental, physical and health hazards, and indicates specific information that must be included on labels of hazardous chemicals and safety data sheets. The United Nations (UN) adopted this standard in 2003 in the hopes of promoting workplace safety and responsible handling of hazardous materials, and eliminating accidents and injuries due to misguided chemical use. Consider the number of safety data sheets you want to place in your GHS SDS station. Single stations with 2" binders hold up to 400 pages and are ideal for companies with less chemicals to handle, while those with 3" binders hold up to 600 pages and are perfect for average-sized companies.Double station with two 3" binders, meanwhile, are the best choice for companies handling several chemicals. 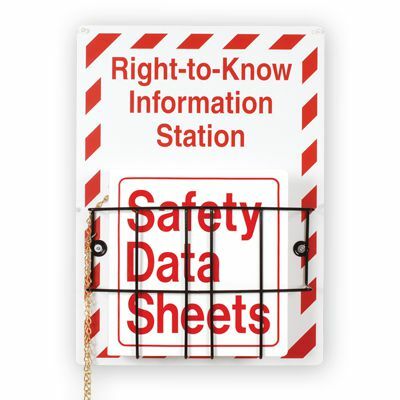 All our SDS binders come with a 36" chain and two S-hooks to keep binders at station and eliminate lost information. English or bilingual GHS right-to-know station? Bilingual RTK centers are often the better choice particularly for English/Spanish workplaces. Even if you don’t have a bilingual workforce now, some of your English-speaking employees and possible site visitors might prefer Spanish safety data sheets. Some people, however, prefer a simpler and clearer approach with less text. In this case, the English-only right-to-know stations are the ideal choice.